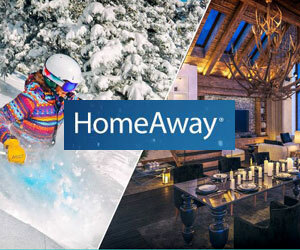 Find your own ski in and out by owner rental in Copper Mountain-click on this link! The Cache at Union Creek- 2 Bdrm, 2 bath, slps 4, from $160/nt -- - Book it! Trip Advisor #FKN2323293 -The brand new executive 2 bedroom is located in the Cache Building at Union Creek. It is a 2 bedroom, 2 bath and has 1100 square feet. It is short walk to the new high-speed chair lift! The beautiful kitchen has granite counter tops and there are great mountain and ski area views. This condo also includes wireless highspeed internet, ceiling fans in every room (yes, it does get warm here sometimes! ), and surround sound. Washer/dryer in unit gas grill gas fireplace 2 t.v.s/DVD one car heated garage community hot tub. 'No Such Thing as Global Warming on Copper Mountain!! '-1 bed, 1 bath, slps 6, from $89/nt - Book it! VRBO 290804- Copper Mountain offers world-class Colorado skiing/snowboarding and it is the ultimate destination for your next family getaway. This is the perfect place for families to relax, re-connect, have fun, and spend quality time with family and friends while creating new lifelong memories. 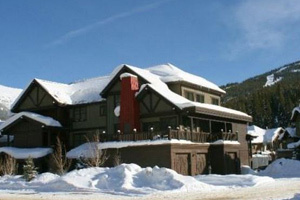 Our privately owned condo is an updated 1 Bed/1 Bath unit that is truly ski-in/ski-out. It is in the Lodge at Copper, which is located on the west side of Center Village, at the base of the mountain next to the American Flyer lift. The unit/attached porch faces the ski mountain, not other condos, parking lots or freeways! Our unit has a spacious living and dining area and is approximately 752 sq. ft which could comfortably accommodate 6 people. For the person(s) tasked with cooking, the kitchen is extremely well stocked for all your cooking needs (including: stainless pots, dishes, crock pot, blender, toaster, coffee maker, sandwich & waffle maker). The living area includes a full size pull out sofa bed (with upgraded mattress) and tucked away in an alcove, sits a cushioned window seat, that contains a new queen size upgraded pull out bed mattress (replaced 7/16). 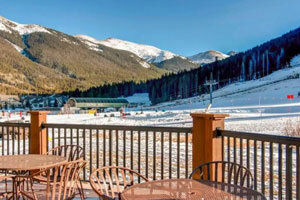 Copper Mountain Ski Condo-1 bed, 1 bath, slps 6, from $100/nt - Book it! 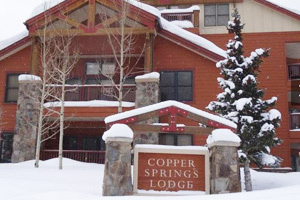 Enjoy a luxury vacation at Copper Springs Lodge for a great price! This one bedroom unit is 145 square feet larger than the average one bedroom at Copper Springs Lodge. The bedroom has a queen-size bed, and there is a queen-size Murphy bed as well as a queen-size pull-out sleeper sofa in the living room. You get all this for the price of a one bedroom unit! 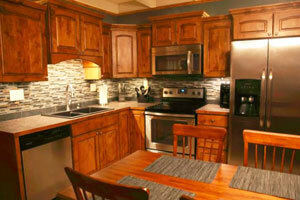 Colorado Summit Vacation in Newly Upgraded 5-Star 2-Bdrm Condo- Attractive Rates-2 bed, 2 bath, slps 7, from $169/nt - Book it! VRBO 501391- We are in the heart of the beautiful Wildernest/Eagles Nest area in Summit County. You will find that everything in this updated mountain getaway has been nicely appointed and we mean EVERYTHING. Our guests are enjoying our brand new top-shelf kitchen with stainless steel appliances, custom knotty alder cabinetry and woodwork throughout, custom stone gas fireplace, brand new furniture and furnishings throughout, 3 new LCD TVs, new paint, new carpet and tile, completely new tiled bathrooms, new windows and coverings, new linens, new EVERYTHING! Property management recently saw our unit has said it is one of the nicest if not, THE NICEST unit in the Treehouse complex. Please help yourself to our reviews from guests and see that every season is represented. Our condo is conveniently located in the Wildernest/Eagle's Nest area of the White River National forest. We are just minutes from top recreation areas:Dillon Lake(3.5 mi) Keystone (10 mi), Breckenridge (17 mi), Copper Mountain (14 mi), and Arapahoe Basin (14 mi). Vail and Beaver Creek are also within easy driving distance. -3 bed, 3 bath, slps 9, from $389/nt - Book it! 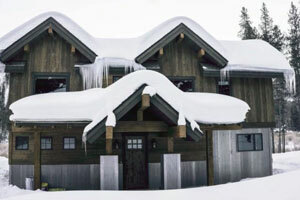 Cozy Copper Mountain Condo for rent (three bedroom, two bath). Located at Foxpine Inn, Copper Mountain Colorado. Unit is located 100 feet from 'Super B' six person chairlift. Building has a hot tub, restaurant, under ground parking, wireless internet, and many other amenities. -3 bed, 3 bath, slps 9, from $365/nt - Book it! VRBO 960865- Spend a vacation at this beautiful 2100 sq ft, 2.5-acre mountain property, built in 2017. This luxury cabin stands at exactly 10,000 feet above sea level in a quiet location, just three miles south of Main Street in Breckenridge and one mile from the Goose Pasture Tarn. The main living space is a rustic-style open concept with a lounge off the great room featuring TV, cable, and XBox 360. Plan your next adventure here with a supply of trail maps and guidebooks. Our kitchen is well-stocked and has plenty of space to prepare food for multiple families. The home features rustic touches such as grand timbers, steel beams, and granite countertops and modern conveniences like radiant floor heating and wifi. Upstairs, guests will find comfortable new mattresses and cozy bedding. Master bath features free-standing bath and an oversized double shower with rain shower heads. The home stocks items to make it comfortable for your little ones (Pack N’ Play, high chair, toys). Our large deck backs to open space and mountain views, and features a hot tub, propane grill, and patio set. You’ll find a private trail leading down to the Blue River, where beaver, moose, and deer are spotted throughout the year. 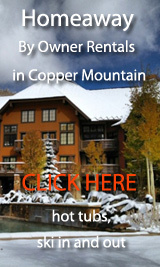 Copper Mountain By Owner Rentals-Our Blog! Great Deal:1 bed, 1 bath, slps 6, from $89/nt - Book it!